Everyone agrees that the food at Ho-Lee Noodle House is delicious—unless it happens to be deadly. Lana Lee’s stake in her family’s Chinese restaurant is higher than ever now that she’s been made manager. So when she enters Ho-Lee into Cleveland’s Best Noodle Contest, Lana makes it her business to win—at all costs. But when a local food critic receives a threatening note in a fortune cookie and is later found dead, face-down in a bowl of lo mein, all bets are off. . .
Lana Lee, manager of her family’s Chinese restaurant, is rooting for their chef to win this year’s Cleveland’s Best Noodle contest. While celebrating an encouraging first round, Lana and others from Asia Village witness the murder of one of the contest judges. Norman was rude and opinionated and had many enemies and few mourners. Although Lana wasn’t a fan either, she doesn’t like the idea of a killer on the loose in her neighborhood. So with some behind the scenes support from her best friend and roommate Megan, Lana looks into the murder and her questions soon put her on the killer’s hit list. This is the third installment in the series. 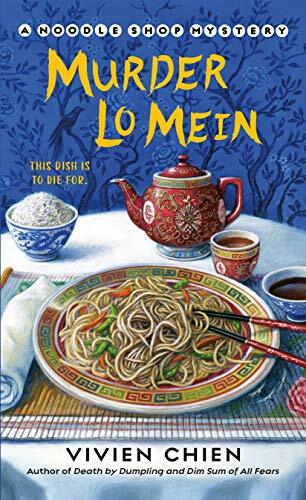 It may take new readers a while to figure out who all the important characters are since there are a lot of them, but it’s not necessary to have read the first two books to enjoy Murder Lo Mein. I like that in this book Lana has finally embraced her role in her family’s business and is actually beginning to enjoy being the manager of Ho-Lee Noodle House. I like Lana’s friendship with Megan and also enjoy her relationship with Detective Adam Trudeau. These interactions make the book more interesting and the characters seem more realistic. I love the addition of Lana’s grandmother who is visiting from Taiwan. Although they have a hard time communicating because of the language barrier, they are still developing a sweet, loving relationship. Parts of the investigation are very interesting as Lana tries to get to the bottom of the case and figure out if anyone else is in danger. She focuses her investigation on the most likely suspects, but after a while she starts going around in circles which gets old. I also don’t like the way Lana promises Adam to keep him in the loop on what she’s investigating and not to do anything stupid and then promptly puts herself in danger! However, her actions lead to a dramatic conclusion to the case. After the killer is identified, Lana can relax and the book ends on a positive note for her. Fans of Naomi Hirahara will enjoy the latest by Vivien Chien.